It’s hard to believe it’s been half a century since John F. Kennedy was assassinated while politicking in Dallas, Texas. Because, today Friday, Nov. 22 is the 50th anniversary of the assassination of President John F. Kennedy, we thought it was appropriate to provide our readers something special they probably had not read before about the slain president. Former FBI Agent James Hosty told Don Moore, senior writer for the Charlotte Sun daily newspaper, Port Charlotte, Fla., during an interview about President John Kennedy’s assassination on the 40th anniversary of his death in 2003, J. Edger Hoover blamed him for the President’s murder. What follows is the interview and a question and answer session Moore had with the retired FBI agent about what he thought and what he knew about the JFK assassination. What gives him special knowledge? Forty years ago, he was Special FBI Agent James P. Hosty Jr. working as a counter-intelligence officer in the Dallas, Texas, FBI office at the time JFK was murdered. Hosty now lives in Burnt Store Marina, south of Punta Gorda, Fla. He was assigned to investigate Lee Harvey Oswald before the Communist sympathizer pulled the trigger. He found no legal reason to put Oswald away. And that was the FBI man’s downfall, according to J. Edgar Hoover, director of the FBI, and the Warren Commission, which investigated the assassination. Hosty didn’t arrest Oswald before the president was shot. And the Warren Commission concluded Oswald was the shooter. It was FBI agent James Hosty’s job to keep tabs on Lee Harvey Oswald days before he assassinated President John F. Kennedy in Dallas 50 years ago today. To make matters worse for the retired agent, Hosty’s name and number were in Oswald’s address book when he was captured by the Dallas Police Department shortly after killing Kennedy. Hosty visited the Oswald home shortly before the president’s assassination. He talked to Oswald’s wife Marina about her husband when he wasn’t home. She passed the agent’s name and phone number on to Oswald, who put it in his address book. Hosty says 40 years later that neither he nor anyone else in the law enforcement-intelligence business in the United States had reason to suspect that Oswald was going to assassinate JFK. Hosty believes he became the fall guy when Hoover and the commission needed someone to blame. As a consequence for not arresting Oswald before the assassination, Hosty was banished by Hoover to the Kansas City, Kan., FBI bureau. In those days it was considered by the director as the graveyard for agents who failed in the line of duty. But Hosty’s opinion of Kansas City was that, “Hoover had thrown me in the briar patch,” a reference to an Uncle Remus story by writer Joel Chandler Harris. The FBI agent meant Kansas City was a great place for him and his late wife, Janet, to raise their nine children, and a good place for an FBI agent to work. United Nations Ambassador Adlai Stevenson came to Dallas to make a speech a couple of weeks before Kennedy was shot. Stevenson was jeered and heckled by a group of Minutemen called the “Indignant White Citizens Council,” known in earlier days as the Ku Klux Klan. No one wanted a similar occurrence when the president arrived. So most of the Dallas Police Department’s officers surrounded 30 or 40 of Walker’s right-wingers stationed along the parade route. They were trying to keep the Minutemen from hassling the president or worse, according to Hosty . “The truth of the matter is that security in Dallas (for the president) that day was nonexistent,” he explained. “The Secret Service was undermanned and understaffed and they couldn’t do the job. “The night before Kennedy was killed, the Secret Service didn’t have any manpower left to guard the president. So they brought in off-duty Fort Worth firemen to guard him after deputizing them. “The Secret Service (in those days) had fewer than 300 men in the entire United States. To complicate things further, they had so much pride in what they did they wouldn’t let any other federal agency help them. The FBI had 85 agents in the Dallas-Fort Worth area. We could have guarded Kennedy, but they wouldn’t work with us,” Hosty said. A day or so before Kennedy arrived in town, one of the local papers published a map of his proposed parade route. Thus knowledge of where the president was going and how he was going to get there became common knowledge. JFK and his entourage would drive right by the FBI’s headquarters and the Texas Book Depository, where Oswald had just gotten a job. 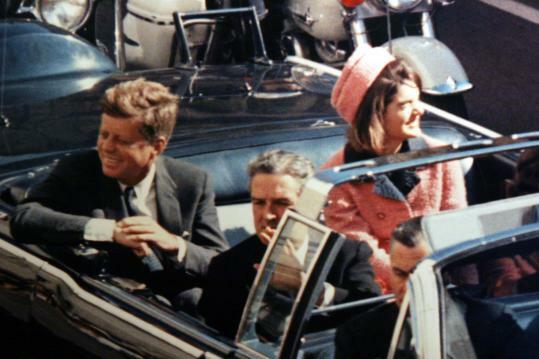 Moments before President John Kennedy was assassinated in Dallas, he and his wife, Jackie, were all smiles as they gazed at the adoring crowd during their trip to Dallas, Texas on Nov. 22, 1963. Hosty hoped he could catch a glimpse of the president as he drove by in the open Lincoln convertible. A Democrat and an Irishman just like John Fitzgerald Kennedy, Hosty thought the president was his man. At 12:38 p.m., the FBI agent was eating a cheese sandwich in a restaurant near the department’s headquarters in downtown Dallas when a waitress said, “Oh, my God, they’ve shot the president!” Hosty didn’t know it at the time but her words would change his life. It wasn’t long before Oswald’s name was mentioned as a potential suspect. Immediately, Hosty realized Oswald was his case. “It has been determined that your recent handling of a security-type case was grossly inadequate. “In view of the slipshod manner in which you handled this (Oswald) investigation, you are being placed on probation. It will be incumbent upon you to handle your future duties at a higher level of competence so that future administrative action of this nature will not be necessary. 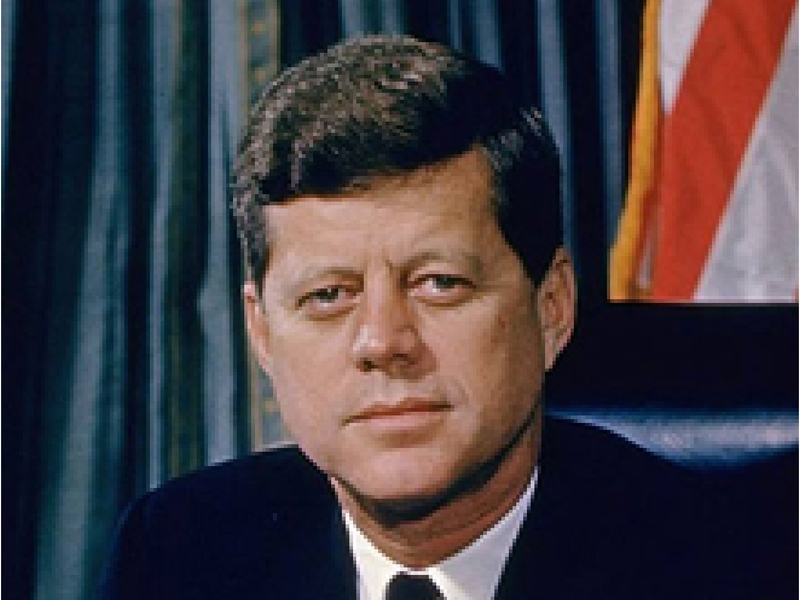 The result of the Warren Commission’s 10-month investigation into the president’s assassination was that the FBI hadn’t sufficiently helped the Secret Service protect JFK. To take this logic one step further, Hosty reasoned “…I was directly responsible for the president’s death,” according to J. Edger Hoover and the Warren Commission. Two days later, Hosty found out from his boss in the Dallas office that he was being transferred to the FBI’s Kansas City office by direct order of Hoover. This story was first published in the Charlotte Sun newspaper, Port Charlotte, Fla. on Sunday, Nov. 16, 2003 and is republished with permission. Please click here for another interview related to JFK and Dallas, Texas. What part did Castro, Russia or the Mafia play in JFK’s assassination? 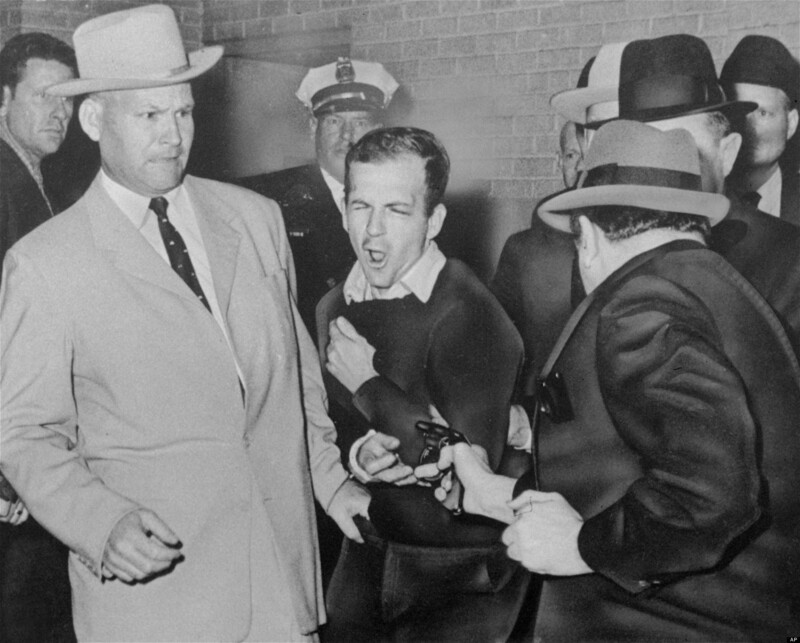 When Lee Oswald was gunned down by Jack Ruby while being moved from the Dallas Police Department jail to a more secure location, the likelihood of the public ever finding out for sure why he shot President John Kennedy evaporated. However, special Agent James Hosty, the FBI man in charge of the Oswald investigation, believes JFK’s assassination, provides some revealing answers to a number of vexing questions surrounding the case. Q: Why did Oswald assassinate John Kennedy? 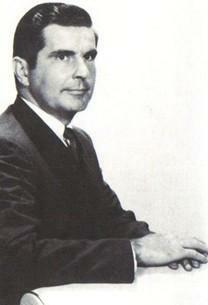 FBI agent James Hosty said Jack Ruby shot Lee Oswald because Ruby was a Kennedy supporter. Oswald walked by him while being transferred from the Dallas jail with a smirk on his face – that was too much for Ruby. Q: Do you think there is a possibility Oswald assigned Kennedy at the direction of the Cuban Embassy? Q: How about the Russians? Could they have had a hand in the killing of President Kennedy, using Oswald as the hit man? Q: Weren’t there a lot of people who wanted Kennedy dead? Q: How could Oswald fire three bullets in about 10 seconds with a bolt-action rifle? 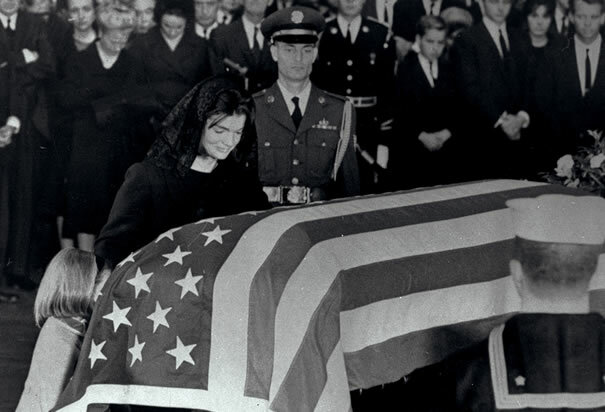 First Lady Jacqueline Kennedy kneels beside the coffin of her slain husband in the Rotonda of the capitol. Q: Is there any chance Jack Ruby’s Mafia connection might have had some ties to JFK’s assassination? Q: Why did Ruby shoot Oswald? Q: What about the anonymous call the FBI received the night before Oswald was killed that there would be an attempt on Oswald’s life if he was moved out of the Dallas Police Department jail? Q: Tell me about the Warren Commission and its report? Q: If I said to you, who do you think killed President Kennedy, what would you tell me after all these years? James Hosty died of prostate cancer June 10, 2011. He was 86.